CannabisNewsWire Editorial Coverage: The CBD market is experiencing explosive growth as a result of growing mainstream acceptance and strong leadership. The North American CBD market, worth more than $9 billion in 2017, is projected to be worth $47 billion by 2027. Growth is possible partly through mainstream acceptance, with pressure on a variety of institutions to accept medical CBD. 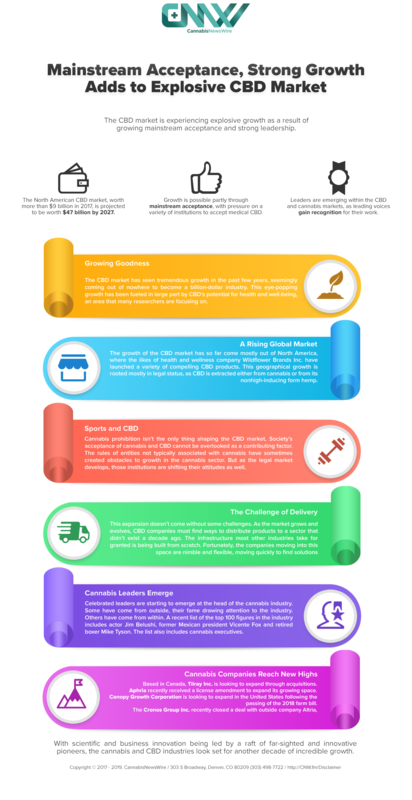 Leaders are emerging within the CBD and cannabis markets, as leading voices gain recognition for their work. Wildflower Brands Inc. (OTCQB: WLDFF) (CSE: SUN) (WLDFF Profile), which focuses on health and wellness products, is benefiting from this growth through the establishment of strong distribution deals. Several companies are responding to the growth by expanding operations. Canadian-based Tilray Inc. (NASDAQ: TLRY) is adding production capacity in both Canada and Europe. Aphria (NYSE: APHA) (TSX: APHA) is increasing its indoor grow operations. Canopy Growth Corporation (NYSE: CGC) (TSX: WEED) is focusing its development efforts on projects in the United States. And Cronos Group Inc. (NASDAQ: CRON) (TSX: CRON) is using a significant outside investment to make strategic growth plans. The CBD market has seen tremendous growth in the past few years, seemingly coming out of nowhere to become a billion-dollar industry. This eye-popping growth has been fueled in large part by CBD’s potential for health and well-being, an area that many researchers are focusing on. Companies have leapt upon the opportunity to offer consumers the benefits associated with cannabis without some of the other issues regularly linked with the drug, including getting users high. If the past few years have been fruitful, the future looks even brighter for CBD. Soaring sales, growing acceptance within mainstream sports, and the recognized influence of some of the major players within the broader cannabis industry all point to positive movement forward for CBD. And as companies overcome the challenges offered by distributing a previously obscure product to a broad market, the industry looks set to soar. The growth of the CBD market has so far come mostly out of North America, where the likes of health and wellness company Wildflower Brands Inc. (OTCQB: WLDFF) (CSE: SUN) have launched a variety of compelling CBD products. This geographical growth is rooted mostly in legal status, as CBD is extracted either from cannabis or from its nonhigh-inducing form hemp. Though legalization of cannabis remains variable in the United States, hemp is now legal at a national level in both the United States and Canada, with cannabis growth widely permitted. As a result, the North American cannabis — including CBD — market, has grown in spectacular fashion. The market was worth $9.2 billion in 2017, and estimates project those numbers to reach $47.3 billion by 2027. Savvy companies, such as Wildflower Brands, are paying attention and taking action. The European CBD market has seen less expansive growth. Within the EU, the range of processed products that can be made incorporating cannabis is more limited, and there’s been less of a concerted push towards legalization for both CBD and cannabis products. Consequently, market growth there has been less impressive. But that may be about to change, according to analysis from market intelligence firm the Brightfield Group. The company recently predicted 400% growth in the European CBD market from 2018 to 2023, a massive rise in a short five-year span. It looks as if the CBD boom may be set to go global. Cannabis prohibition isn’t the only thing shaping the CBD market. Society’s acceptance of cannabis and CBD cannot be overlooked as a contributing factor. The rules of entities not typically associated with cannabis have sometimes created obstacles to growth in the cannabis sector. But as the legal market develops, those institutions are shifting their attitudes as well. The sports industry is an ideal illustration of this. During the war on drugs, many teams, leagues and professional organizations took a firm public stance against cannabis, laying down rules that prevented their players from indulging. The NFL, for example, has strict rules against cannabis consumption. Currently, however, former players are campaigning for a change to those rules, not just to allow players access to the same experiences as other people but to tackle issues specifically related to sports. Recently, cannabis and CBD-infused products, including those such as Wildflower’s topical treatments, have provided a growing number of pain-treatment choices. Given the injuries so frequently seen in professional sports, pain management is crucial. Sports doctors, trainers, coaches and players are always on the lookout for the most effective treatment options. Currently the ban on cannabis and CBD restricts players from choosing such seemingly effective options, fueling the call for change. Changes could also have a significant impact on the sponsorship side. Currently, only one professional sports team in the United States has a cannabis-related sponsorship, despite the growing wealth and influence of the industry. As barriers come down, the time may come for CBD, much like other recreational and medical products, to gain attention in the sport and beyond through sponsorship and supporter arrangements. This expansion doesn’t come without some challenges. As the market grows and evolves, CBD companies must find ways to distribute products to a sector that didn’t exist a decade ago. The infrastructure most other industries take for granted is being built from scratch. Fortunately, the companies moving into this space are nimble and flexible, moving quickly to find solutions as they expand and grow. These solutions often include forming partnerships with other players within the cannabis sector to increase their combined reach. Wildflower has recently done this through a delivery fulfillment agreement with HelloMD, a leading digital healthcare platform for cannabis doctors, consumers and brands. The deal will allow Wildflower to potentially reach more customers through HelloMD’s expansive e-commerce platform. Such moves should increase opportunities for CBD businesses to accelerate their expansion and reach a broader customer base, reversing years of prohibition. These partnerships may not only boost individual businesses but also add to the rising tide of CBD. Celebrated leaders are starting to emerge at the head of the cannabis industry. Some have come from outside, their fame drawing attention to the industry. Others have come from within. A recent list of the top 100 figures in the industry includes actor Jim Belushi, former Mexican president Vicente Fox and retired boxer Mike Tyson. The list also includes cannabis executives such as Terry Booth of Aurora and Elizabeth Hogan of GCH. Wildflower Brands CEO William MacLean was included in the list, thanks to his hands-on approach to sales and marketing. His extensive travels to hospitals in North America have also given him insight into patient experience and the benefits that cannabis and CBD can offer. Combined with years of marketing experience, this impressive background puts MacLean in a strong position to market his brand and build teams of skilled experts for ongoing growth. As the cannabis sector expands, many companies are going through periods of growth and rising revenues. Over the past few years, this rocketing trajectory has allowed the cannabis sector to diversify in interesting ways. Based in Canada, Tilray Inc. (NASDAQ: TLRY) is looking to expand through acquisitions. The company recently acquired the largest hemp foods company in the world — Manitoba Harvest — to strengthen its foothold in the exploding hemp market. The company is also making other strategic growth and development moves, including moving into Europe. Aphria (NYSE: APHA) (TSX: APHA) recently received a license amendment to expand its growing space. Headquartered in Leamington, Ontario, Aphria is working to set the standard for the low-cost production of safe, clean and pure pharmaceutical-grade cannabis at scale, grown in the most natural conditions possible. Aphria is committed to bringing breakthrough innovation to the global cannabis market and has a presence in more than 10 countries across 5 continents. One of the large Canadian cannabis companies, Canopy Growth Corporation (NYSE: CGC) (TSX: WEED) is looking to expand in the United States following the passing of the 2018 farm bill. Canopy is building a hemp-production facility in New York state and acquired hemp enterprise AgriNextUSA, moves that position the company to make the most of America’s swing towards hemp and become a leading player as the market heats up across North America. Canopy Growth boasts an extensive range of licenses and distribution deals north of the border, giving it a strong base from which to build its U.S. business. The Cronos Group Inc. (NASDAQ: CRON) (TSX: CRON) recently closed a deal with outside company Altria, providing that company with a way into the hemp space. The C$2.4 billion strategic growth investment will provide Cronos with essential resources to expand during its critical phase of market growth in the United States. With scientific and business innovation being led by a raft of far-sighted and innovative pioneers, the cannabis and CBD industries look set for another decade of incredible growth. Next Next post: Should You Be Worried About Cannabis Use Causing Psychosis?